Bikes, beer and barbells. How was your Wednesday? Ashley Schmieg, from the left, Stacey Eberhard and Nora Dwyer visit Wednesday after completing the Workout of the Day at Warrior Crossfit Muscatine. What a day. It started with a new nemesis, The Barbell Complex, at Warrior Crossfit Muscatine. It ended with a pretty good 24-mile dinner ride to the Lighthouse in Fairport. In between the workouts, I did a little Kiwanis Club business, worked on a job application and started an interesting discussion on Facebook about bike parking. Crossfit: The workout was challenging. 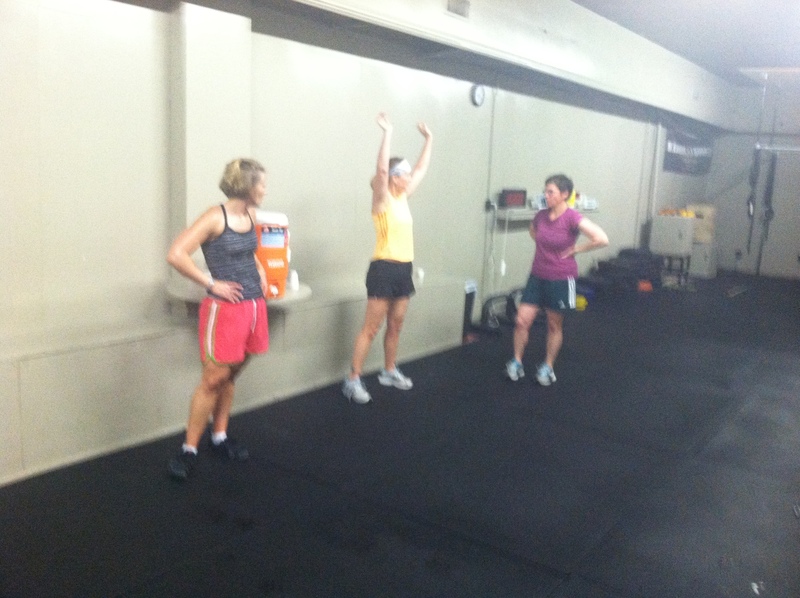 We warmed up by stretching, working on foam rollers and doing five sets/three repetitions of dead lifts. We added weight for each set and I finished the last set with 210 pounds, the most I have lifted so far. For the actual workout, the aforementioned Barbell Complex, we did 10 sets of six repetitions of the following: Dead lifts, upright rows, shoulder cleans, front squats, shoulder presses, back squats and push ups. We were given two minutes to do each set. For the first five sets, I used 65 pounds. I dropped down to 45 pounds for the final five sets. It was challenging, to say the least. The bike ride: I rode with Dan, Julie, Dan, Diane, Jeanne, Paul, Steve, Georgia and Chuck. We left Harper’s Cycling & Fitness, took Houser Street to Mulberry Avenue, headed north all the way Muscatine County Highway F70 and then took Sweetland Road to Iowa Highway 22. From there, we rode east four miles or so on Iowa 22 to the Lighthouse. 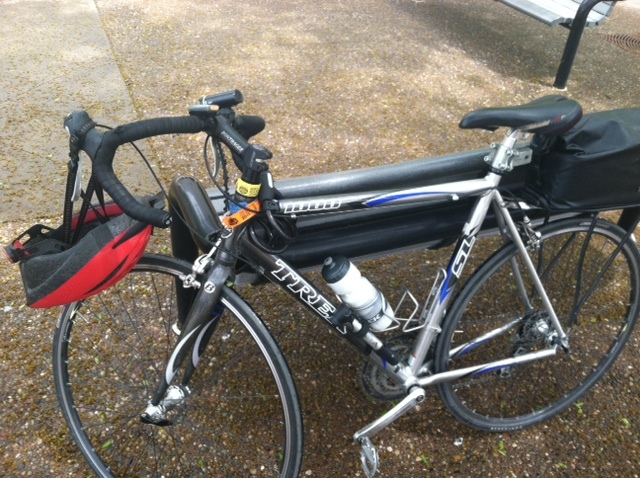 The ride took me 86 minutes for an average of not quite 17 mph. I like beer: After reading the discussion from Wednesday’s post, I followed the advice of a friend, Dr. Michael Maharry, and had two Bud Select 55s at the Lighthouse after we finished the dinner ride. Some other friends have been encouraging me to try the paleo diet for 30 days. I have joked it would never work because I don’t want to give up beer. What would be the point of riding a bike if there is no cold beer to drink afterward? 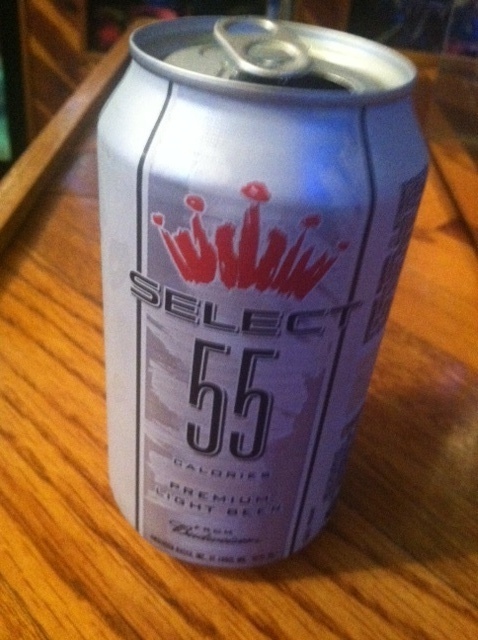 But if drinking beer means drinking Bud Select 55, giving it up completely might not be as big of a sacrifice as I think. Food log: For breakfast on Wednesday, I ate a bowl of oatmeal with a piece of toast and peanut butter — basically what I ate on Tuesday. 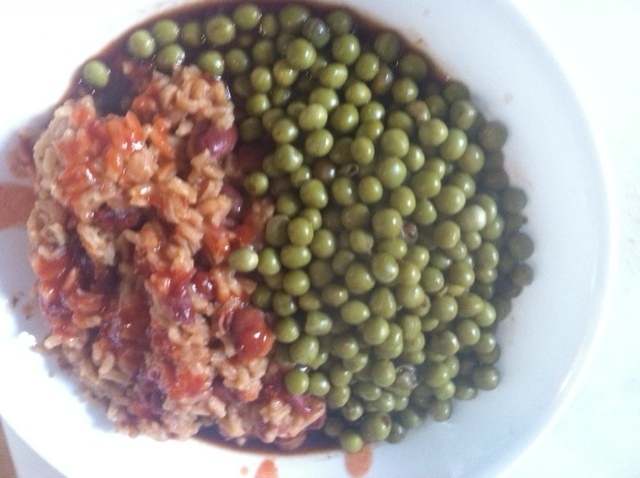 For lunch, I had rice and beans and peas and an apple. 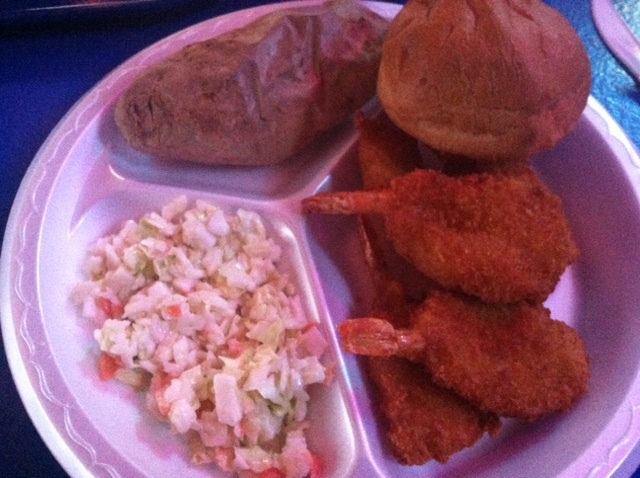 For dinner, I had jumbo shrimp, a baked potato with some sour cream, cole slaw, a dinner roll and the two aforementioned beers. If you can really call that stuff beer. Bike parking: I’ll write more about this in a later blog post. To make a long story short, bike parking is not really good at two of the places where I stopped Wednesday, Musser Public Library and Stanley Consultants. I tweeted about it and started an interesting discussion on Facebook. When I have a little more time, there is much I’d like to say about this beyond that initial tweet. So far you haven’t answered the question of “What would be the worst that would happen if you tried strict paleo for 30 days?” And what WOULD the point of a bike ride be without a cold beer at the end?